Google isn’t the biggest corporation on Earth, but is arguably the most important. Certainly, if one is to understand the 21st Century and the impact of technology and the Internet on our personal, professional and civic lives, Google is the single company that must be understood. And before you ask — yes, all of this will be in the quiz. [Steven Levy] You use Google’s retreat from China to illustrate the company’s decision-making processes. But there were several big decisions involving China, beginning with the commitment to enter the market, even though it meant censoring search results. How did you balance the business side with the moral one? [Eric Schmidt] My position at the time was that on balance, China would be better off with Google than without, subject to censorship. That’s always been my view. It’s my personal view of life. I would prefer that we engage with Cuba. I think we would be better off. It wasn’t so much the idea of engaging with China but what you had to do to engage with China — censor search results. [Schmidt] We made the decision to enter, knowing we would have these problems. And I think a fair reading of the five years is that things got worse. One problem after the other, just a series of problems operationally. [Jonathan Rosenberg] Although from a business perspective, our market share was actually improving. [Schmidt] It’s fair to say that we had a process to go in, and we had a process to go out. Everybody agreed, and we knew what we were getting ourselves into. It’s not like we were blindsided. The situation did worsen. And then [after Google was hacked] there was the meeting on Sunday [January 10, 2010, when Google decided its future course in China]. I knew when I entered that meeting that we were going pull out. 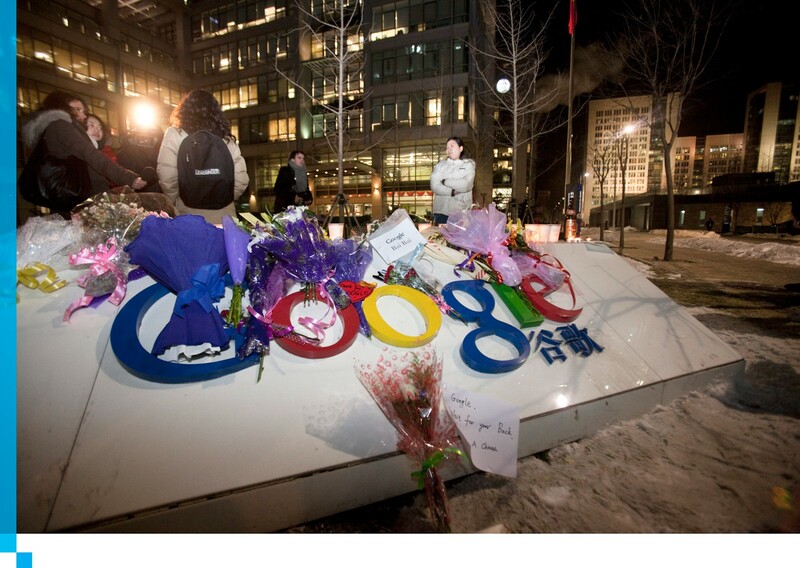 People congregate and take photographs at a make-shift tribute outside the Google office in Beijing, China, on Wednesday, Jan. 13, 2010. Google defied the Chinese government by saying it will end self-censorship of its search engine and essentially quit the world’s largest Internet market after attacks on e-mail accounts of human-rights activists. Because you lost Larry’s support? He was the key because Sergey was always the most skeptical of the China experiment. [Schmidt] Because I had spoken to both Larry and Sergey thoroughly and I knew where they were. And so I had the benefit of knowing the choreography. But that doesn’t mean that the choreography is not important. The choreography is incredibly important because you have to build buy-in. Remember that the management team is not in agreement. Again, you have half and half. And so you have to spend the time to have the debate. We ultimately had a vote, then we had a two-day process of communicating this to the board and working with the Chinese government. 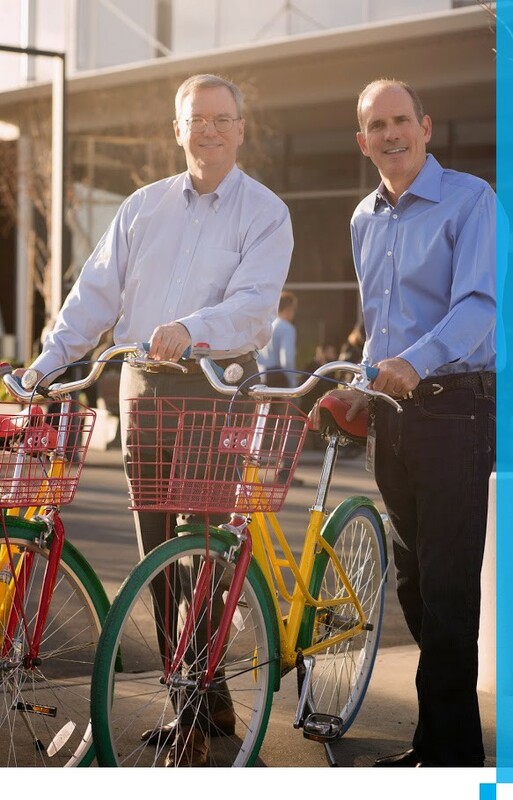 It’s an interesting dynamic because it illustrates how, for the time that you were the CEO, there were three people running Google. You had determined that because of who the founders were and how smart they were, there would be this troika, and in disputes two out of three would carry the day. [Schmidt] It’s not voting. The troika did not work this way. The agreement we had during the period I was CEO was that if it was really important we would not act unilaterally. We’re friends, right? But we would have very clear and strong arguments as to what was in the best interest of the company and sometimes I would win, sometimes Larry would win, sometimes Sergey would win. Sometimes my job with the two of them was to let them have an argument and tell them to come up with a better solution. It was very much the right approach. [Schmidt] Yes. but if you look at every successful tech company, for a fair amount of time there were two or three people who acted in concert. Let’s just review the history. Intel—two or three people. Now do you remember the exact title of Gordon Moore before Andy Grove? We forget. Look at the history of Apple — Steve and Steve. Then think about Microsoft [with Bill Gates and Paul Allen.] Ours was distinguished by the fact that it was longer. We have this emotional appeal to the single-horse leader. 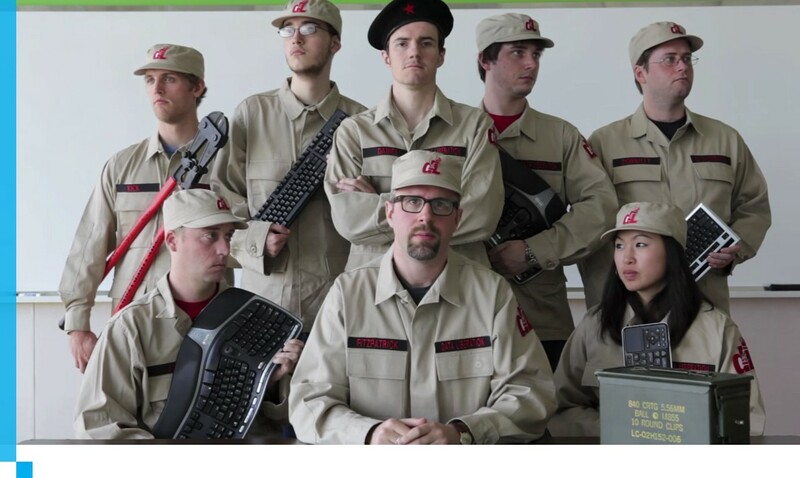 But in fact, human organizations work better with tight little teams. The beauty of Larry and Sergey and myself—and it’s true today—is that we have never had a dispute as to our ethics with respect to our goal. We may disagree on the mechanism but there was never a misalignment of goals. 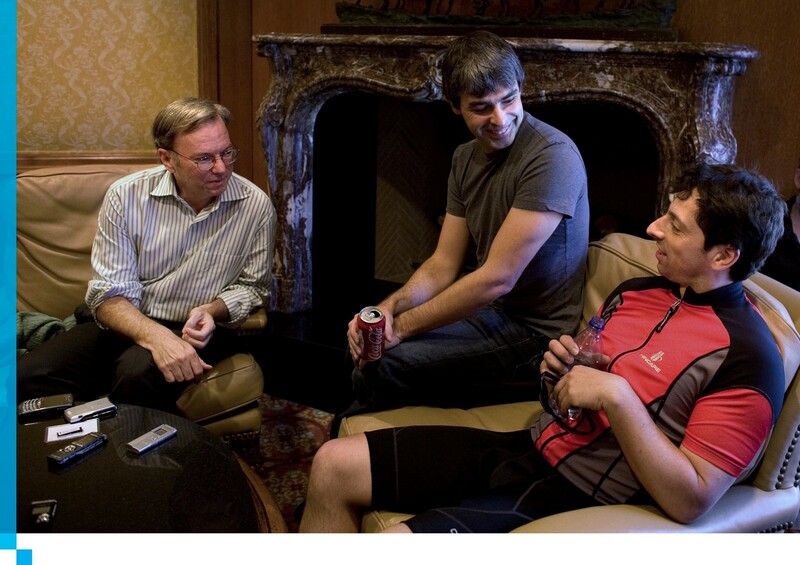 From left, Eric Schmidt and co-founders Larry Page and Sergey Brin, speak with members of the media during the 26th annual Allen & Co. Media and Technology Conference in Sun Valley, Idaho, U.S., in 2008. [Rosenberg] The members of the executive team really knew that you could go to which ever one was the most accessible. It wasn’t as though I remember thinking “Gee, I should try to game this and I should talk to Sergey first and then Eric or Larry.” You just went to whichever one of them was available and there was so much going on that you often needed one of them and you knew that by the end of that day that person was gonna relay to the other two what had transpired. Larry is not a traditional CEO by any means. But in terms of autonomy, his role now is more conventional than the CEO’s was when you were in charge. At Google today he’s running things as more of a sole leader. [Schmidt] I think that’s correct. It’s different styles for different stages of the company. With scale has come the need for clarity of decision-making and frankly Sergey and I are gone. Sergey shows up for the staff meetings but he is busy working on Google X. But I think the principles of alignment are still there. Everyone is still in alignment. Now let’s talk about Google’s motto, “Don’t be evil” Useful compass point, or an albatross in that whenever people see Google in what they consider moral lapse, they use it against you? That happens to this day? [Schmidt] Yes it is absolutely true. [Rosenberg] That absolutely happens to this day. [Schmidt] But the problem I have with the albatross scenario is that we don’t have a book that defines evil in terms of how we should specifically behave. I think we understand as a culture what is good and what is evil. You need some mechanism to judge that. So I welcome the criticism that “this is evil” but it’s also possible that the critic is wrong, right? In other words, the critic doesn’t understand the trade off, doesn’t understand the consequence. I spend lots of time with people criticizing Google on this or that and I sit there and I think, “I just don’t agree.” Our products are free, we’re providing this huge benefit…this is a reasonable trade off. That’s what guides our process. The one thing that is different now from the ‘don’t be evil’ of ten years ago is that when we’re doing something which is privacy-related or controversial in some fundamental way, there is an awful lot of discussion well before it. It used to be we would just throw these things out there and get ourselves into trouble. We don’t do that anymore. I find your answer interesting because there have been multiple companies, including Google, that start out small and scrappy, and everyone loves their scrappiness. Then they become bigger and more powerful, especially if they’re involved in technology that has a big impact on people’s lives. And a certain number of people become suspicious of the company. But internally everyone inside the company says something like you just said— “We’ve looked at the data, we’re not doing anything different than we did before, and we know in our souls that we’re good persons.” How does a company manage that both internally and externally, when people don’t see them the way they see themselves? [Schmidt] We knew that we were going to have this problem. About a decade ago, Larry actually sent out a memo saying how to be big without being evil. And as part of [a response to] his memo, which was just his thoughts, we ultimately created the Liberate Group, which would allow you to take your data away from us. Google, as far as I know, is the only large company that makes it easy for you, via the Data Liberation Project, to take information out of the company. [Rosenberg] And they actually have power. They meet with the teams. [Schmidt] It’s real. It’s not fake. So why would we build such a group? Well first because it was a good idea from Larry, second because the group is very passionate, but the third is it serves as a check and balance on bad strategy. If your strategy is to prevent your customer from leaving you, you probably shouldn’t have had those customers in the first place. But you could imagine a product team getting itself into a strategic corner somewhere inside the company and ending up in a situation where they really want to keep people [against their will]. So think of it as sort of a rule that is enforced internally that keeps teams more honest. Eric, you know and I know about Data Liberation at Google, but to be honest, a lot of people don’t know about that. I don’t think it’s moved the needle of perception. [Schmidt] No, but that’s not the point of it. There is a difference between public perception and internal perception. The data liberation group’s fundamental function is to keep the internal teams from misbehaving, because they know that they can’t keep the information captive. By the way, this was a direct response to the Microsoft strategy of never letting you out. And by the way, with all due respect to Apple, try getting your information out of the current iOS8 maelstrom. My current hot button with Apple is that if you switch from an iOS to an Android device, iMessage, all your texts are lost. Is that a bug or is that deliberate? It’s been well publicized. It does actually prevent people from switching. Imagine, that you choose to switch and try out Android and you lose all your text messages. It’s actually a problem. But I want to answer your question about our perception on the public side. There are organizations whose sole funding job is to be critical of Google. Right? I do know that, yeah. [Schmidt] We know them, we understand them, their answers are predictable. Look at Fair Search, which is funded by Microsoft. They made all these claims, they’ve been looked at by many governments, the claims are false, they keep repeating the claims. Their job is to create a negative side of [the issues], for those who are not technically sophisticated enough to understand that there were previous claims, they’ve been adjudicated, people have decided there wasn’t anything there. And that’s how our world works. Welcome to having the kind of power that Google has over information. You’re going to have critics and you’re going to have people funded by your competitors. Many people who are not funded by Microsoft are critical of Google. Look at the people like Dave Eggers that write novels about Google-esque companies that are evil. [Schmidt] Well there are people who would argue that he was writing about a different company. I saw The Circle as a mix [of Google and Facebook]. [Schmidt] The good news is that his book is clearly fictional. It’s marked as fiction. Class dismissed for today. Since this is a Tuesday-Thursday course, see you day after tomorrow for the final session.